You've driven for an hour, sat in a plane for 11 more and your body clock is absolutely shot to pieces, so what's the first thing you do upon arriving in your hotel, a little north of the equator? Go wildlife hunting, obviously. Only in this instance it wasn't for a sloth or brightly coloured bird hiding in the rainforest, but for an English-speaking bookseller working somewhere in a (mini) urban jungle. We'd arrived in Costa Rica for our holiday of a lifetime with one goal each. Him: to see a sloth in the wild. Me: to visit a bookshop. Him: pictures, descriptions, locations, that sort of thing. Me: googling "English language bookshop, San Jose". The first entry in my search was Mora Books, and flicking through a few pictures on their Facebook page I knew it was the bookshop for me. As luck would have it, when we set out to explore we realised this bookshop was also a mere five-minute walk from our hotel. It was meant to be. Found on a side street very near the main shopping street of San Jose, Mora Books is a small but perfectly formed secondhand bookshop. From the road I admit a first glance might have put off the ignorant traveller if she'd not done her research and been determined to visit the bookshop no matter what: Painted bars line the building, and looking in from the bright outdoor sunlight all you can see is darkness, a couple of men chatting and a dog. Then you look again and realise the railings are decorated with a Bernie Sanders poster, the men are chatting and relaxed, and they're all surrounded by an indescribable amount of books. Even the most timid of travellers must surely want to step inside? We did. A brief hello welcomed us to the bookshop and we dived into floor-to-ceiling piles and shelves. Where in some places books piled on the floor can be depressing, here it was welcoming, reassuring and a fascinating challenge to explore. Crime, fiction, science fiction and all the usual treats of my favourite British secondhand bookshops were to be found. The classics section was possibly better stocked than some I've visited, as I marvelled at the sight of Aristophanes, Burnett, Eliot, Gaskell, Ibsen, and so on through the alphabet, I even nostalgically flicked through a J M Synge play, remembering my A-level studies. The temptation to buy one, just to be able to say "I travelled almost to the equator and came home with a copy of this classic" was strong, but I had to keep exploring. As mentioned, the bookshop is small, probably comparable to your average independent new bookshop in this country, but as well as the shelves of books there are piles: in front of shelves, in front of the counter, in front of other piles. There was also a sense of care to the piles, these books may not have been sorted as well as the bookseller would like (in his own words, if he's had time to tidy the bookshop, business isn't going well), but the books didn't feel dumped or neglected. Even the obviously most-read books in the worst condition* had still been looked after. Rummaging was of a level of fun comparable to a new bookshop I remember in London, and we could have easily stayed here for the rest of the holiday, but there were sloths to see, and so I had to make my decision: The perks of being a wallflower by Stephen Chbosky. I love the randomness of buying a book that's long been on my to-read list, from a bookshop in Costa Rica. Before leaving we made sure we were introduced to the bookshop dog: Harvey was just the right level of happy but distantly friendly; we asked about the bookshop cat, asleep upstairs – cats keep their own hours; and had a chat with the bookseller – a wonderfully enthusiastic man, I only wish I'd been awake enough to properly join in the conversation. His love of bookselling and friendliness were clear to see but I'm ashamed to admit jetlag has stolen much of the conversation. Costa Rica is a wonderful country and we were lucky enough to see many wildlife treats – including tree frogs, sloths and a sleeping bat – but first impressions count and this bookshop was the perfect start to our adventure. * I would love to know how bibliophiles in humid countries keep their books in good condition? Welcome back! Always a fab part of a holiday, visiting a bookshop, so glad this one didn't disappoint. Sounds like a brilliant trip too - not a part of the world we've ever been to. Thank you! It was an amazing holiday and much-needed. Am very glad I had the opportunity to find this bookshop, it was such a treat and a reassuringly "familiar" way to start our holiday. 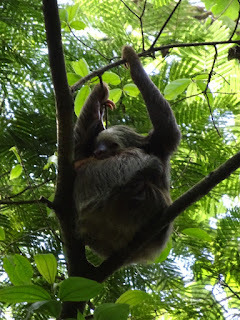 If you like wildlife I definitely recommend Costa Rica - sloths, frogs, armadillos, bats, toucans and more were pointed out by our wonderful guides (we wouldn't've seen them by ourselves). 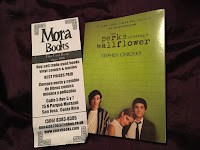 What a great bookshop and a great blog post. Very kind of you to say, it was definitely a great bookshop - and a wonderfully welcoming bookseller! Wonderful! 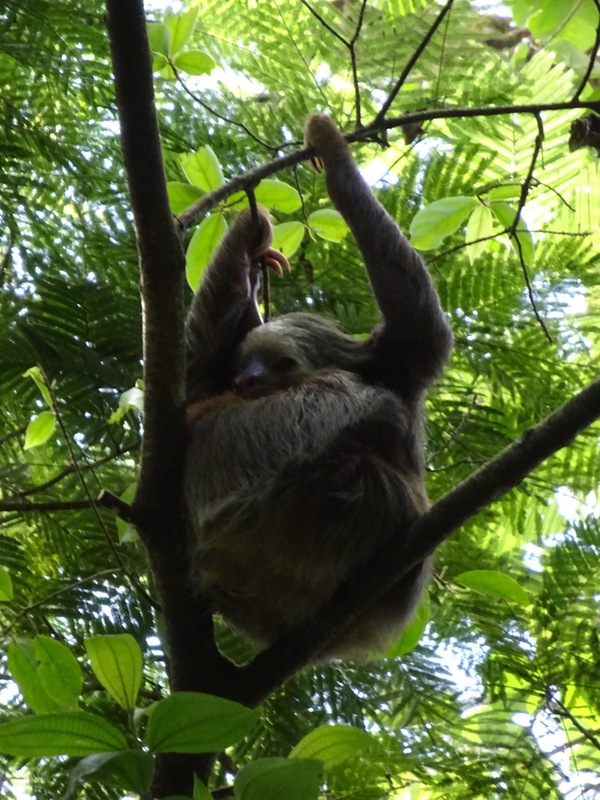 I had an amazing trip to Costa Rica many years ago, and did (finally) see a sloth - a mossy bundle high up in a tree. Didn't find any bookshops (or libraries - my usual busman's holiday requirement!) that time though. Weren't they lovely mossy bundles though? I couldn't quite believe it when the first sloth was pointed out to me. It was such a treat each time we saw one a little more clearly. I didn't get to hear about any libraries but this bookshop was a treat. 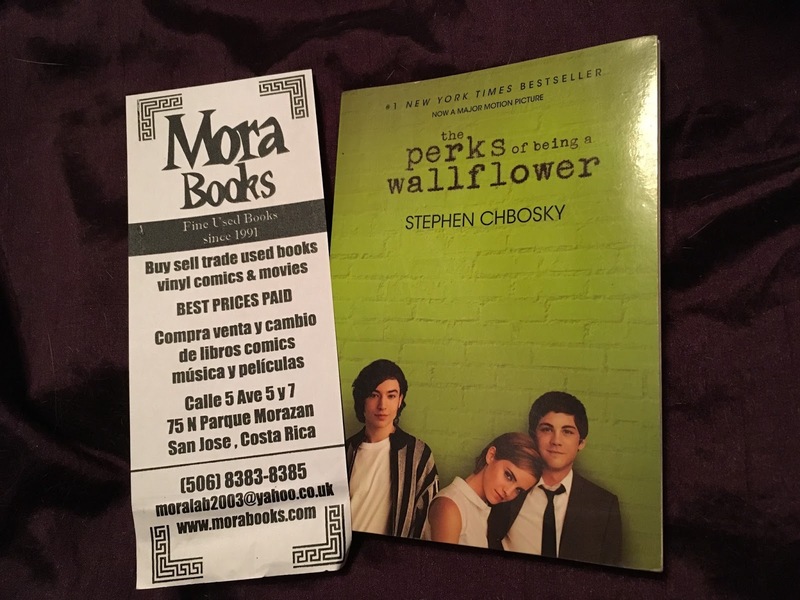 That's so great, to be doing a bookshop in Costa Rica! Glad you had such a good trip, it sounds amazing. Sorry for my slow reply! It was great, I've long wanted to properly visit an international bookshop and this one was an excellent place to start (the country is beautiful too). *To answer your question: I try to keep them in a dry place, with sunlight and I use dehumidifiers in flake form for anything in enclosed spaces. They sell this flakes in small buckets in every supermarket in Costa Rica ... same goes for clothing, paper goods, shoes, et al. I know some people keep electric dehumidifiers that they switch on and off depending on the weather. The best thing is to air them out periodically. Thank you. I was impressed by how good a condition the books in the bookshop were in, even more so by the end of our trip when the book I'd been reading had been massively affected by the humidity!